Laparoscopic adrenalectomy has become the accepted standard for patients with functional tumors or when there is concern for cancer, either primary adrenal or in some instances metastatic lesions. Size based indications for adrenalectomy have begun to change as outcomes improve with the advent of more refined laparoscopic techniques. 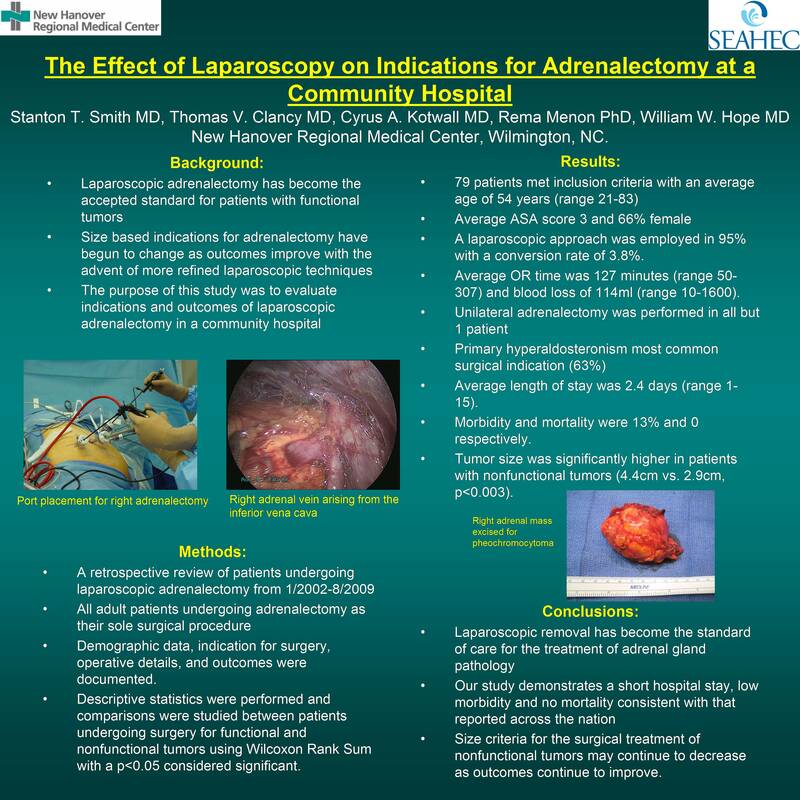 The purpose of this study was to evaluate indications and outcomes of laparoscopic adrenalectomy in a community hospital. A retrospective review of all patients undergoing laparoscopic adrenalectomy was performed following IRB approval from January 2002-August 2009. Inclusion criteria included all adult patients undergoing adrenalectomy as their sole surgical procedure. Demographic data, indication for surgery, operative details, and outcomes were documented. Outcome measures included postoperative length of stay, morbidity, and mortality. Descriptive statistics were performed and comparisons were studied between patients undergoing surgery for functional and nonfunctional tumors using Wilcoxon Rank Sum with a p<0.05 considered significant. During the study period 79 patients met inclusion criteria with an average age of 54 years (range 21-83). Average ASA score was 3 and 66% of patients were female. A laparoscopic approach was employed in 95% with a conversion rate of 3.8%. Average operating room time was 127 minutes (range 50-307) and blood loss of 114ml (range 10-1600). Unilateral adrenalectomy was performed in all but 1 patient who underwent bilateral adrenalectomy for pheochromocytoma. The most common indication for surgery was primary hyperaldosteronism caused by an aldosterone producing adenoma (63%). Average postoperative length of stay was 2.4 days (range 1-15). Morbidity and mortality were 13% and 0 respectively. Tumor size was significantly higher in patients with nonfunctional tumors (4.4cm vs. 2.9cm, p<0.003). Laparoscopic removal has become the standard of care for the treatment of adrenal gland pathology. Our study demonstrates a short hospital stay, low morbidity and no mortality consistent with that reported across the nation. Size criteria for the surgical treatment of nonfunctional tumors may continue to decrease as outcomes continue to improve.